Misawa is a small city in Aomori Prefecture, northern Japan. The surrounding area is mostly rural but there is some limited nightlife, around the American air base nearby. Tokyo is an hour away by plane, about 3 and a half hours by shinkansen (bullet train), and about 10-12 hours by car and maybe 8-10 hours if you drive above the maximum limit (around 80kph is the max limit in the expressway). Misawa hosts a United States Air Force base, which is Misawa Air Base. The base is currently home to the 35th Fighter Wing, The conjoined home of the American and Japanese militaries. We arrived here last summer of 2008 from Hawaii , (my husband's based station prior to Misawa) due to military relocation, he is a US military member. Being a military spouse, I'm excited to experience more of Japanese cultures, their life, food and discover different places around northern Japan (or farther) for a 3- year tour and I will be sharing them with you here in my travelog. I'm joining Patty's "My town photo shootout" (a photographer from Maryland), for this week, although I'm late for the Friday's post :-) thanks Patty for inviting me. Just bear with my photos as most of them are "point and shoot shots" while driving around Misawa. This is the house we are renting, it's a 4 bedroom, 3 bathroom type with one car carage and one car port. 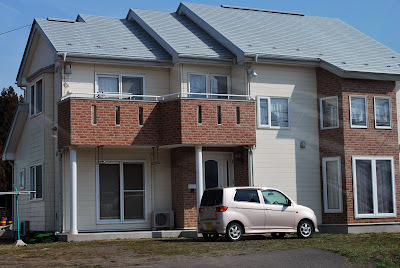 We are in Japan but our house is still American style :-) A lot of Japanese home owners here in Misawa are renting out their houses (and some are still building new houses) to military members based on the Military housing requirements. We are the first renter in this house, they were still building this along with my next door neighbor when we arrived here and waited for about 2 weeks to move in. The photo was taken during our first snow fall here in Misawa. Ooh, didn't know you're joining too! I'm gonna put up your link in my blog, then! Some houses are weird looking but interesting, especially that house with the green and slanting roofs for the stairs! I like the house you're renting, reminds me of.. a sunflower LOL. I like the style too. Wait, if I'm not mistaken, you guys are Filipinos renting an American style house in Japan? so houses in japan are made of wood? Nice presentation. Great tour of your area. I love your yellow house. Thanks for joining us. Next week it is graveyards. Slightly different from how I pictured the houses would be. I do like your house! May I take a peek inside? Hey, thanks for listening to the show again. Hope to see you next Saturday! Enjoy the rest of your weekend. Ooh, okay, cool. So you guys are not going back to the Philippines anymore? Your husband is an American? Didn't mean to sound so nosy, I just feel like knowing friends LOL. 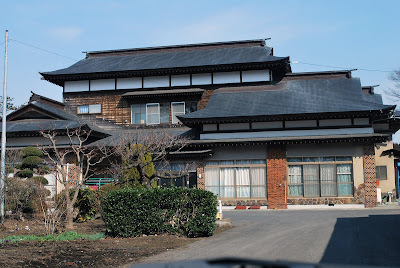 Wow, I find those American style houses interesting, didn't expect to see those in Japan. hey! you're from japan too ;-) i've never been to aomori, i'm based in chiba now. your house looks nice! caryn- thanks for visitng my site, where is chiba? is it in Tokyo?? I have the option of heading that way in March. Where's the best place to live in Misawa? I'm sure I'll receive more information about that soon, but I'm trying to research as much as possible now. Thanks. Jeffrey- right now, effective Sept. 1, 2009 you can no longer rent a house off base. Housing management will offer you either housing or tower unless there are no available houses/tower on base. I hope you will enjoy your stay here in Misawa. You can visit www.35fss.com to see some of the tours they offer. Thanks for visiting my blog. I'm so glad to have read this blog here, giving me ideas how Misawa looks like. I'll be as well spending my next 3 years in the place with my partner. Hope to see more photos. Anonymous- thanks for visiting my blog and I hope you will enjoy your stay in Misawa. The Japanese people are so nice and respectful ;-) it's just sad for us to leave earlier than our scheduled stay. Wow, I guess we can all keep dreaming right. Some beautiful homes here. Kind of interesting how wide of a variety there is of architecture.Thank you.